Kramick's Portal Cadaverous is where Judges and Players come together to share their stories of tragic character deaths that take place in Order of the Quill Adventures! "I almos' didn't see you there behind those opaque, milky spirits you carry. Not the spirits I was hopin' for, mind you, but spirits none the less. Well don't doddle. You've come to the right place. Over there now, cast your dead here in my portal cadaverous before their memory fades. What's that you inquire? Their feelings!? Why they're dead you ninny! Now fill out the paperwork and begone... before I force upon you feelings of pain!" May time extend eternal span. 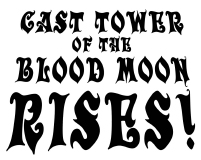 ADVENTURE TITLE: Tower of the Blood Moon Rises! BRIEF DESCRIPTION OF FATAL INCIDENT: In Area 7–2, Dingleroot, delusional from Grahamtart poisoning, attempted to swallow his own hand. He believed it to be a slice of his grandmother's homemade Bramblejam pie. His fellow adventurers tried to dissuade him, arguing that he was hundreds of miles from his grandmother's in Hobbiton. In the end, Dingleroot died from self–induced suffocation upon the stone floor.